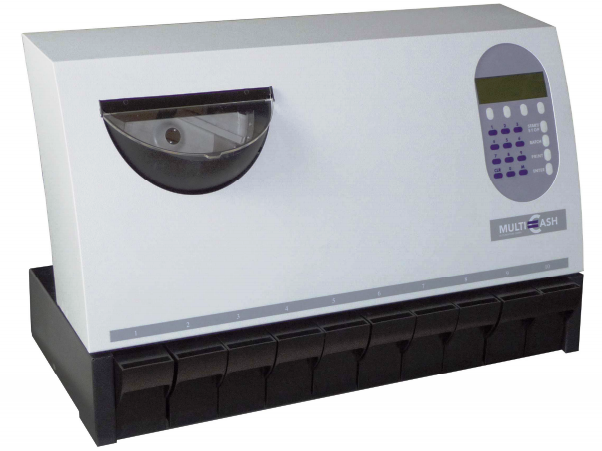 ﻿ Coin Counting Machine, Coin Sorting Machine. MC 10 active counting and sorting machine offers a blockage free sorting with active sorting technology through solenoids. The MC series offers professional counting and sorting for up to 9 different denominations.Damaged, foreign and counterfeit coins are rejected automatically. A dialogue display cares for self-describing usage and the unique sorting technology of the MC 10 active guarantees a flexible and blockage-free use. With this “active” sorting technology more coin bins can be used for one denomination, two currencies can be sorted and even coin types with same size can be sorted. Triple coin sensor with magnetic based alloy sensor in high end quality and Capacitive sensor for the evaluation of the coin surface offers high accuracy during coin counting rejected all the counterfeit and foreign coins. Coin Counting Speed:Up to 900 coins per minute. Cash Automation is not an option,it is a responsibility!